I’m sure that fledgling photographers must feel a sense of frustration when, having grasped the concept of using a smaller aperture to produce greater depth of field and that greater depth of field means sharper images, some smart aleck brings up the subject of diffraction. 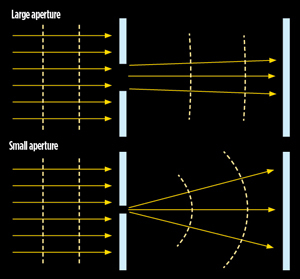 While it is true that the laws of physics and light waves mean that as the physical size of the aperture is made smaller, depth of field increases, diffraction also becomes a more significant factor and it softens the image overall. This means that photographers who use the smallest aperture available to them in the belief that they are getting the sharpest possible images are actually losing detail. However, by spending a little time investigating the performance of their lenses across their aperture ranges, they can maximise the amount of detail they capture. A perfect lens would perform best wide open, but unavoidable aberrations mean that in the real world detail resolution usually increases when the aperture is closed down by 1 to 2 stops. Photographers often stop down further than this to achieve greater depth of field. Depth of field is a fact of physics and the smaller the aperture, the more extensive the zone of sharpness will be. It is also a feature of the lens rather than the camera, although pixel size and circle of confusion diameter do come into play. 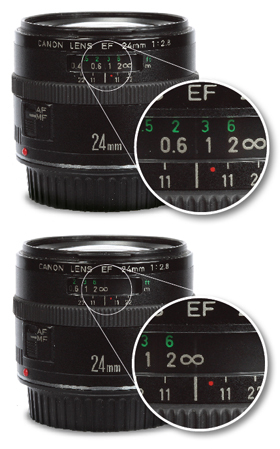 If a full-frame lens is used on an APS-C-format camera, the depth of field that it produces at any particular subject distance is the same as when the lens is used on a full-frame camera. However, to achieve the same composition with a full-frame lens on an APS-C-format DSLR, the camera has to be moved further away from the subject. As depth of field increases with subject distance, the image produced by the camera with an APS-C-sized sensor has greater depth of field than the image from the larger-format camera. Many discussions of depth of field quickly become bogged down by complex maths and depth of field tables for different focal length lenses on a selection of cameras with different-sized sensors and a range of subject distances. However, most photographers are primarily concerned with capturing the maximum amount of detail they can in an image. But what is the best aperture to use? Closing down the diaphragm of a lens extends the zone of sharpness of an image until the effects of diffraction become significant and there’s noticeable softening of the image. The point at which diffraction becomes an issue remains the same regardless of the subject distance, and is a feature of the lens and camera. 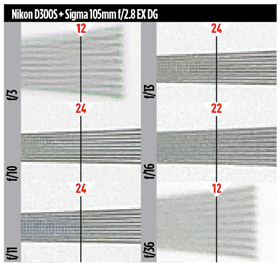 This makes it easy to identify the smallest aperture that can be used without diffraction limiting image quality. Although a test chart like this one can be used, almost any stationary subject with fine detail can be employed as a target. With the camera on a tripod and, if possible, set to mirror lock-up mode, shoot a sequence of images at every available aperture, progressing from wide open to the smallest aperture. 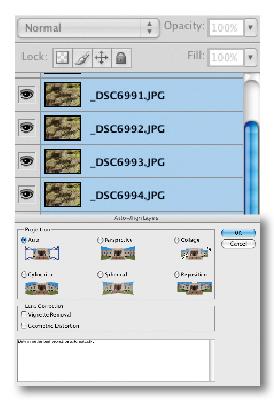 Once the images have been transferred to the computer, open them in an image-editing software package and examine them at 100% or Actual Pixels size. It’s helpful to arrange the images alongside each other to make comparison easy. With Adobe Photoshop select Window>Arrange>Tile Horizontally/Vertically and make sure the option to scroll all windows is selected in the options bar. Photoshop CS4 and CS5 users, though, must select Window>Float All in windows first. With the Hand tool selected, click on one image and then the Actual Pixels button in the options bar. Then select Window>Arrange>Match Zoom and Location (or Match All). This ensures the same section of every open image is visible on-screen and the Hand tool can be used on any to scroll around each picture. 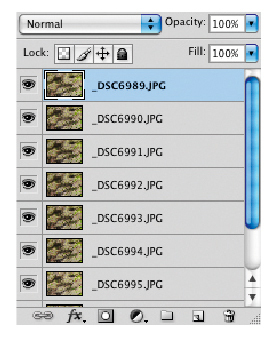 Photoshop Elements 8 users should select Window>Images>Tile, followed by the Actual Pixels button and then Windows>Match Zoom and Windows>Match Location. Find the point of focus within the scene and examine each image carefully. The images should be arranged in the order that they were shot, so those taken at wider apertures will be at the top of the screen and those shot at smaller apertures will be at the bottom. 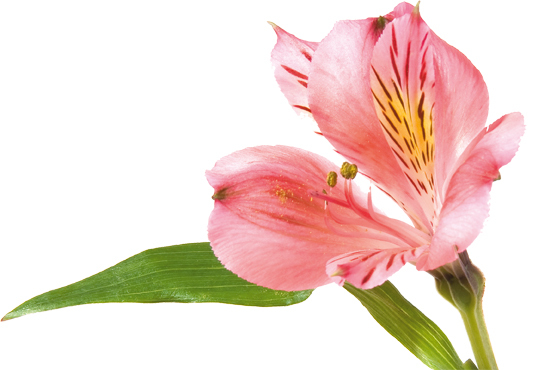 Typically, the images will start off a little soft, become sharper and then get softer again. You need to identify the image before diffraction makes the next shot noticeably softer. Then check the Exif data (File>File Info> Camera Data 1) to find the aperture this image was taken at. This aperture offers the best compromise between depth of field and diffraction and is the smallest aperture that should be used for that particular lens and camera combination. A number of factors contribute to the visibility and clarity of detail in an image, not least of which is resolution, but contrast and sharpness (or acutance with film) are also significant. The resolving power of a lens or a digital camera is the amount of detail it is able to distinguish or record and is usually measured in line pairs per millimetre (lpmm), with high numbers indicating the presence of lots of detail. This detail is more visible when contrast is high and, in the case of a resolution chart, the black and white paired lines can be distinguished. 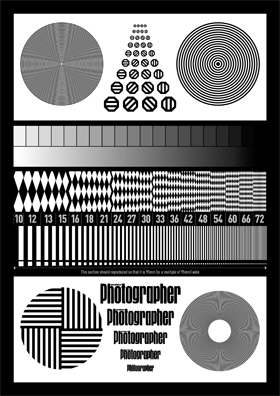 When a lens with a relatively low resolving power is used to photograph a test chart, the black and white lines quickly appear to merge to form a broad grey strip. Increased contrast makes the paired lines and the point at which they blur together more visible, but it doesn’t increase the resolution. Similarly, greater acutance, or edge contrast, gives the impression of sharpness, but can in fact reduce resolution by destroying very fine detail. Avoiding the effects of diffraction means using a larger aperture than you might instinctively select for shots that require front-to-back sharpness. This can be a particular issue with landscapes that have foreground interest as well as details on the horizon that need to be sharp, and in macro photography where depth of field is severely restricted at the best of times. 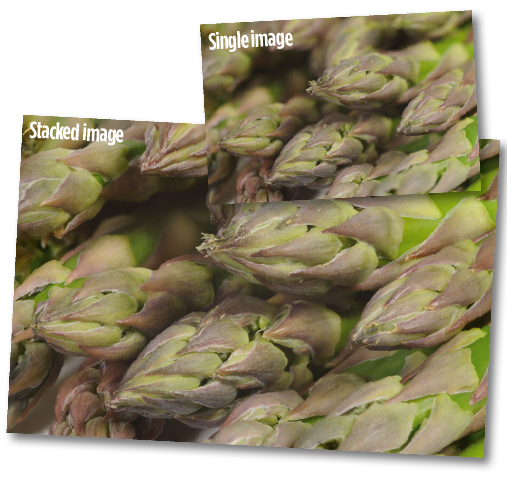 Fortunately, digital imaging offers a convenient solution in the form of image stacking. This enables several images with shallow depth of field to be combined into a single image that is sharp throughout. 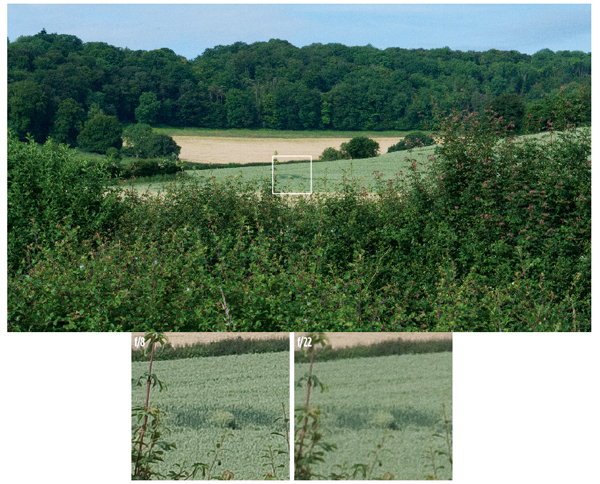 The first step in stacking images is to capture a series of shots in which the focus point is slightly different. It’s important that the framing remains constant while the images are shot, so the camera needs to be held rock-steady on a tripod. Because focal length changes with focus distance, the composition of the image can change slightly throughout the sequence and this may mean the final image needs to be cropped. With this in mind, shoot with slightly more space around the subject than you intend to include in the final image. With the camera in manual focus mode and the optimum aperture selected, focus on the nearest part of the scene that needs to be sharp and take the first shot. Then adjust the focus a little further into the scene and take the next shot. Repeatedly adjust the focus and shoot until you have images in which each section of the scene is sharp. Alternatively, with macro subjects, the lens focus ring can be left untouched and the camera moved very slightly, perhaps using a micropositioning plate, to move the point of focus across the subject. The idea is to capture images with overlapping areas of sharpness. 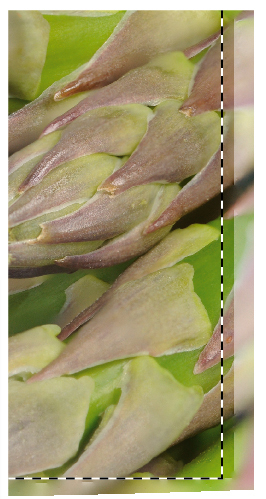 It can be helpful to use the magnified view of reviewed images as a guide to where to focus for the next shot. The depth of field achieved by the selected aperture may mean that only two images are required, but three is a sensible minimum that will allow smooth blending. However, scenes with restricted depth of field are typically covered by a dozen or so images. Although the images can be merged into one in any image-editing package that supports layers, the simplest option is to use software that is specifically designed to do all the layer masking and blending for you. Photoshop CS4’s Auto Blend Layers option has a stacking option that is ideal, but otherwise CombineZM is easy to use, works well and is available as a free download for PC users from http://hadleyweb.pwp.blueyonder.co.uk/CZM/News.htm. Like CS4, it automatically adjusts for the distortion and slight changes in composition that result from the change in focal length when the focus point is adjusted. Step 1. In Adobe Bridge select the series of images you want to use (they can be processed in advance if necessary) and select Tools> Photoshop>Load Files into Photoshop layers. Step 2. Once Photoshop has created a single file with layers containing the data from each image, select all the layers by clicking on the top and bottom layers in the Layers palette while holding down the Shift key. Then select Edit>Auto Align Layers, with the Auto option selected. Photoshop may take several minutes to align all the layers correctly. Step 3. 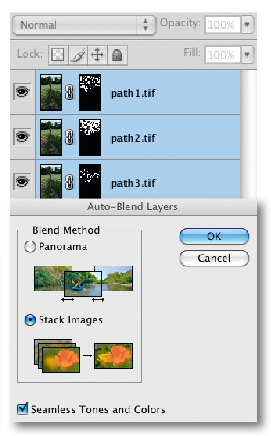 Now select Edit>Auto Blend Layers and select the Stacking option. Again the software will process the images for a few minutes. The end result is an image created from the selectively masked layers and which is optimised to reveal the focused areas of each shot. Step 4. If necessary the masks can be edited, but otherwise, merge the layers into one using Layers>Flatten Image and then crop out any edge artefacts. Shadows don’t have sharp outlines because light bends as it brushes past the object, creating a soft glowing edge. In the same way, when light passes through the hole of your lens aperture, that which brushes the edges of the iris bends away from the parallel path of the rays that pass through the middle. This bending of the light is called diffraction. When the aperture is physically large most light passing through the hole will be unaffected by bending as only a small proportion will encounter the edges of the blades. When a small aperture is used (a higher f-number), a greater proportion of the light will come into contact with the blades and thus will be diffracted. 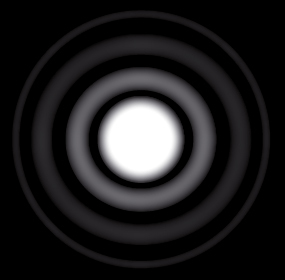 Diffraction creates a soft glow around each focused circle on the sensor or film, and when the proportion of diffracted light to unhindered light is high the glow around the bright inner circle widens. When the glowing areas of the two circles are so big they overlap, resolution begins to fail. Diffraction and aperture diameter have an inverse relationship, but image detail is only lost when circles combine. Hyperfocal distance focusing ensures the depth of field is put to good use. For instance, there’s no point in the depth of field extending beyond a landscape’s horizon if the foreground is mostly soft. Once you’ve discovered the optimal aperture for a particular lens and camera combination, hyperfocal distance focusing allows you to get the maximum benefit from the depth of field. It is easier to focus at the hyperfocal point with monofocal lenses because they usually have depth of field scales with distance and aperture markings. With the required aperture selected, the scale displays the nearest and farthest points of sharpness. Adjusting the focus of the lens so the infinity point lines up with the selected aperture maximises the use of the lens’s depth of field at that aperture. 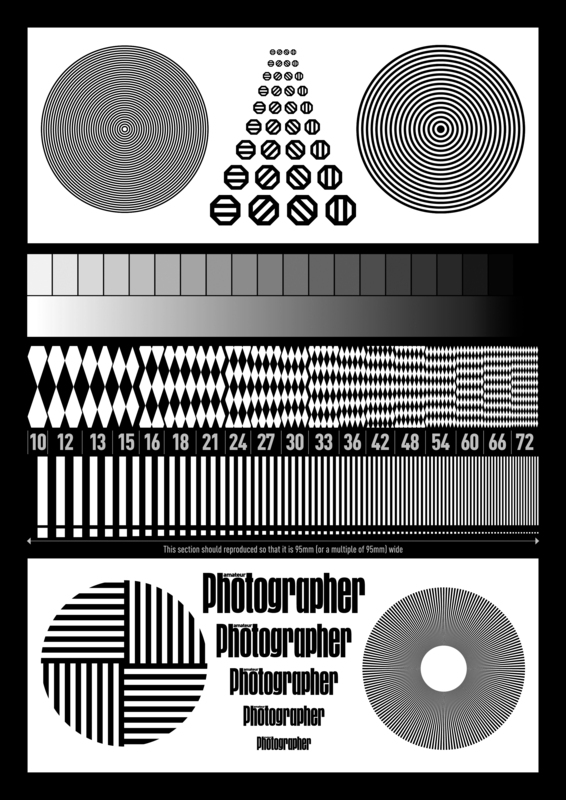 Zoom lenses don’t have depth of field scales, but it is possible to find tables showing the hyperfocal distance point. Few photographers use a tape measure to find the focus point as most rely on the lens’s distance scale, but as depth of field generally extends twice as far beyond the subject as in front, a more common approach is to focus about a third of the way into the scene. Experimentation and experience enable photographers to discover the best focus distance to use with any particular lens.